The old Hive Hub, an integral part of the smart home system which includes Active Heating, was a smallish box that had to be connected directly to your router. This new-generation hub is wireless and builds in microphones so it can listen out for certain sounds and send you an alert. How much is the Hive Hub 360? It costs £99 from Hive. That's not a whole lot more than the original £80 Hive Hub, but while the original offered no tangible benefit other than actually allowing Hive products to connect to the internet, the new one does. It isn't yet available in the US but will cost $139 when it does launch. Once we have a US release date we'll update this article. When is the Hive Hube 360 release date? The Hub 360 was launched on 13 March and is available to buy immediately in the UK. What's new about the Hive Hub 360? Well, looks for a start. While the old hub was a plain off-white plastic box, the new one is clearly designed to be placed somewhere it can be seen. Using design and styling cues from the recently launched Hive View camera, the Hub 360 is available in Black & Brushed Copper and White & Champagne Gold. It replaces the old hub and frees you from locating it where your router is as it has built-in Wi-Fi. More importantly, built-in mics record sound in your home and anything out of the ordinary - smoke alarms sounding, dogs barking or glass breaking - is recorded and sent to you via the Hive app so you can decide for yourself if action needs to be taken. 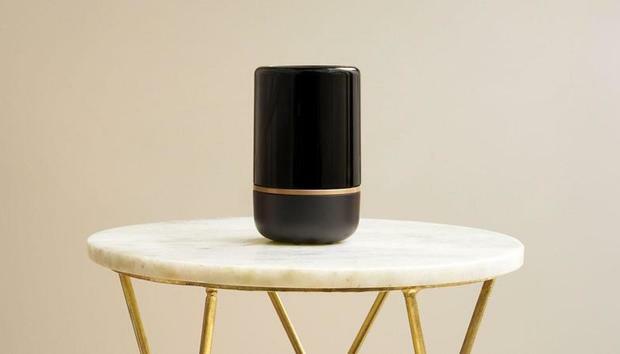 Hive says it has "enhanced Zigbee range" and the mere fact it can be placed in the centre of your home should mean devices at the farthest points have a stronger connection. There's an LED light ring, but muting the microphones is achieved in-app rather than via a physical button. There's another benefit, too. The Hub 360 can continue to allow your Hive Actions to work even if your internet connection goes down. Built-in memory means the actions you've set up, such as lights or switches turning on will still happen without broadband. The hub measures 130mm tall and is 81mm in diameter. Amazon Echo: Which Alexa smart speaker is right for you?